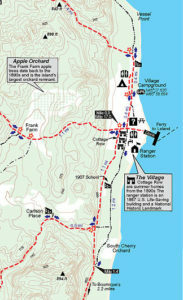 North Manitou Island is the newest map from MichiganTrailMaps.com, your trusted companion for trail information. The large format map measures 11 by 17 inches, is printed on durable card stock and coated to be water resistant. Includes all distance markers, contour lines, historic buildings and ruins. Best of all, when folded it fits in your back pocket or the side pouch of your pack. 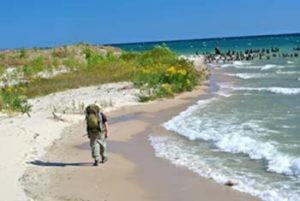 Located in Lake Michigan, North Manitou is wild, isolated and remote, qualities that make it the premiere destination for backpackers in Michigan’s Lower Peninsula. The 14,753-acre island is 7.7 miles long, 4.2 miles wide and laced with 30 miles of designated trails and secondary trails. North Manitou is the most northern section of Sleeping Bear Dunes National Lakeshore and managed as a wilderness with a ban on motors, off-road vehicles, mountain bikes, and pets. Other than the Village Campground, North Manitou features only wilderness camping. The trails on North Manitou wind through impressive stands of maple and beech, across clearings that used to be farm fields and along bluffs overlooking Lake Michigan. The highest point on North Manitou, nearly 1,000 feet, is located in the island’s rugged northwest corner. But overall, the terrain is gentle on North Manitou and most backpackers will find the hiking is level and easy. Some backpackers arrive to search out the historic buildings and other remnants of North Manitou’s intriguing past. But most are seeking to escape into the solitude. They want to spend their days hiking and their nights camped on a bluff overlooking Lake Michigan at a place where there are no cars or city lights. Just the brilliant stars overhead and the roar of the surf on a deserted beach below.